From Goodreads ~ Don Messer was more than a household name in Canada: he was part of family life, the background music in Canadian kitchens, first on radio, and then on television. Private and unassuming, Don was everyman, and yet someone singular and special: a devoted family man, a rigid Calvinist, band diplomat, lover of Kentucky Fried Chicken, and a musical prodigy who from the age of seven knew and played directly to an audience ... an audience that eventually protested in unprecedented numbers on Parliament Hill upon CBC's sudden cancellation of his show, Don Messer's Jubilee. Through collected personal anecdotes and careful research, Johanna Bertin shares the inner complexities of the man family and friends knew: the man behind the music that warmed the hearts of three million fans. 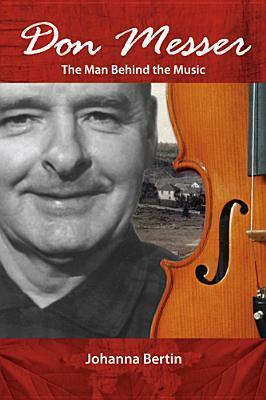 Don Messer (1909 - 1973) was a proud Canadian, fiddler, radio broadcaster and TV band leader. He was known for his "down-east" fiddle style and "old-time" music on radio, TV and concerts. Messer was born the youngest of eleven children in rural New Brunswick. He began playing the fiddle when he was five, eventually playing weddings, square dances, etc. as he got older to make money. He moved to Boston when he was 16 and spent a couple years working at Woolworths. During that time, he took music lessons. When he moved back to New Brunswick, he started working in radio and formed different bands, which eventually had air time on radio. He moved into TV with Don Messer Jubilee in 1956, produced in Halifax, Nova Scotia, on CBC and broadcast across Canada. When it was cancelled in 1969 (there was a national uproar and protest), the show was then produced in Hamilton, Ontario, on CHCH until his death. During all this, he and his band toured across Canada many times. I watched Don Messer Jubilee when I was a kid (back then we only had two channels and you watched what your parents watched) and as I am originally Nova Scotia, I enjoy "east coast" music. I thought his story would be interesting and it was. Messer had the reputation of being shy, controlling and distant so it was interesting to learn more about him. I liked the writing style. In addition to telling his story, the author also included interviews with Messer's relatives, friends and colleagues. Throughout the book, there were pictures of Messer, his family and colleagues. The background and stories of some of the main players in his band (such as Charlie Chamberlain and Marg Osborne) were included.